2003 Winter Fantasy Barbie was the 2003 Holiday Barbie. 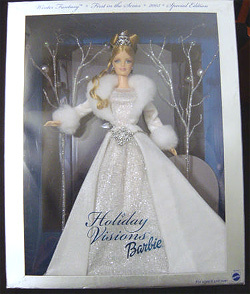 When she was introduced in 2003, she was sold as the first doll in the "new Holiday Visions" series, but she was the only doll in the "series", it was not continued after the first year. 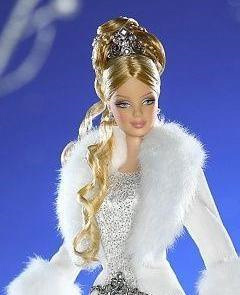 She is very magical looking in her glimmering white gown with the silver trim and tiara and white fur collar and cuffs. She looks like an "Ice Queen" to me and I think she is one of the most beautiful Holiday Barbies. Her box is equally as magical in silver and blue and the shimmering "trees" in the background. Her box has "Holiday Visions Barbie" on the front. She is also available in an African American version and there was a Winter Fantasy Hallmark Barbie Ornament in 2003.